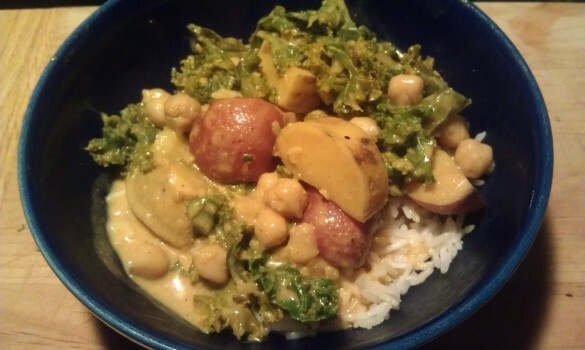 This recipe has evolved from a Thai curry, but I believe that my method makes it closer to an Indian yellow curry. Not only is this curry a real crowd pleaser, the recipe is also is very flexible and wonderful with fall vegetables; such as pumpkin and butternut squash. The sweet potato is a key ingredient though, something about the spices just work magically with the sweet potatoes to create a little piece of curry heaven. This time I used about 8 mini red potatoes with two small white sweet potatoes. Orange sweet potatoes work just as well. Regular potatoes have a longer cooking time than sweet potatoes, so with a good size potato you'll want to toss it into the oven for 20 minutes. 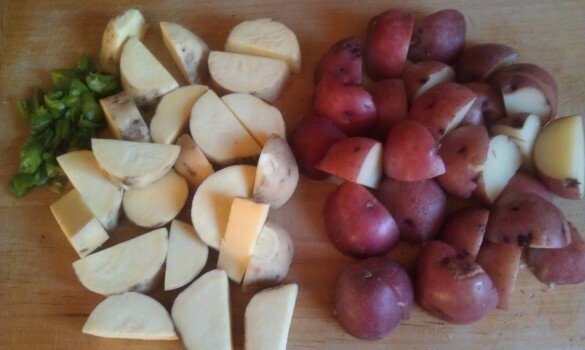 In this case, these red potatoes were small so I microwaved them for 3 minutes on high and then let them cool before cutting them up along with the sweet potatoes. I like the big chunks of potato, but for a more polished dish, cut them smaller than shown. The picture above also has a few diced shishito peppers that I wanted to use up. I thought it added a nice splash of green to the picture. Totally optional. Whisk together the curry sauce (see below for the ingredients) before pouring it into a large lightly oiled pot. Bring the sauce to a low boil and add the sweet and red potatoes. When simmering, adjust heat and cover. At this point dinner is about 30 minutes away. Most of the time I add greens to the curry, Spinach, Chard and Kale all work. For Kale, remove stems and tear into pieces and add it 10 minutes after the potatoes go in for a cooking time of 20 minutes. For spinach or chard, plan on a cooking time of 10 minutes. 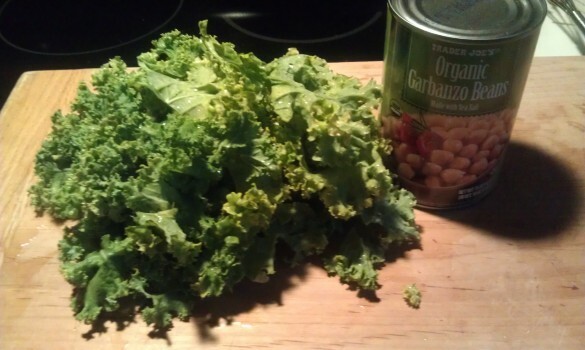 5 minutes before you plan to serve dinner, stir in a can of garbanzo beans into the curry. Serve over rice. Serves 4 - 6. This is a great dish to make extra for quick meals on other nights!